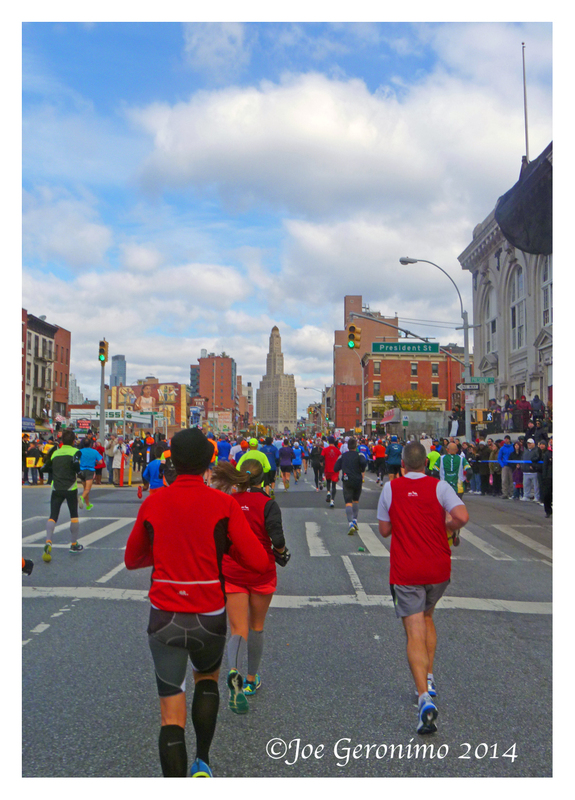 New York City Marathon Expo at the Jacob Javitz Center in Manhattan October 31st 2014. Standing at Fort Wadsworth on Staten Island trying to seek some sort of shelter from the 40 mph winds and the 30 degree temps with very little luck. Layered in pants, sweatshirt, gloves, arm warmers and a hood, chatter from the runners can slightly be heard over the howling of the wind as I begin my stretching routine. I’m in wave 1 corral E with a 0940 start time. Slowly they begin herding us onto both the upper and lower level of the Verrazano Narrows bridge. The wind still howling, I shed my pants, runner chatter slowly fades as our National Anthem is sung, the firing of the howitzer and the New York City Marathon has begun. 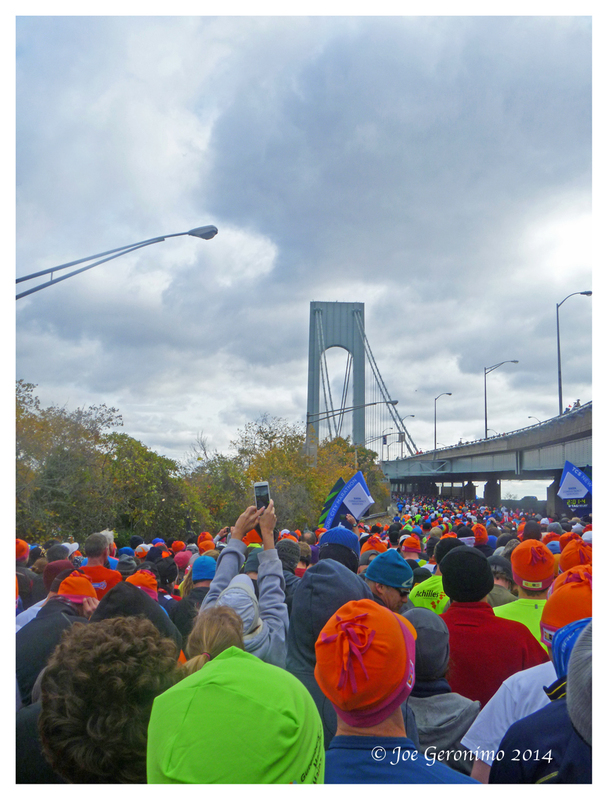 Waiting for the New York City Marathon to start at Fort Wadsworth on Staten Island. Ascending the lower level of the Verrazano Narrows Bridge the wind is like the hand of God, tossing us like pieces of paper into one another, I had all I could do to cross this bridge. Crossing the Verrazano Narrows Bridge from Staten Island into Brooklyn. The wind was ungodly! Descending into Brooklyn the wind fortunately was cut by some of the buildings I would guess and the sun actually felt warm on my face. Shedding my sweatshirt and mistakenly my gloves, nothing I can do but focus on the race. 7th Ave crowds begin to sparsely line the course, winding our way towards 4th Ave and the crowds grow. Bands, DJ’s and MC’s are in control at this point and my watch ticks off the first 5K. My adrenaline is pumping like crazy, I’m at a really comfortable pace. I move to the left side of the road in order to high five the now enormous crowds who are screaming at me, cheering my name, hugging me as I thunder on by. This is my first marathon and my good friend Brian made me a shirt for this occasion “Joe’s First Marathon” and let me just say this shirt gave me Rock Star Status for the day. I’m on a HUGE high right now but I’ve kept myself pretty much on pace in the mid/high seven minute per mile range and my watch ticks of the 10K mark. I’m feeling amazing, body is in sync, breathing spot on and I’m just taking it all in. At this point the wind has been teasing us for a while, the buildings acted both like barriers and wind tunnels. Runners were being pelted with empty water cups making their way through the water stops. 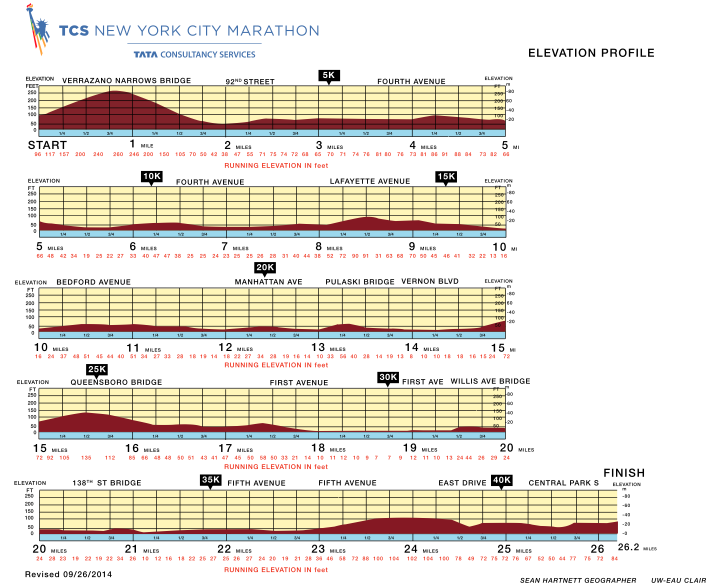 Running along Lafayette Ave, Bedford Ave and Manhattan Ave we make a quick right onto Greenpoint Ave and then a quick left onto McGuinness Blvd and mile 13.1 the halfway point. I remember thinking to myself I can do this its just another half marathon to run as we approach the Pulaski Bridge and the Queens Borough. I believe this is along Bedford Ave in Brooklyn New York. Crossing the Pulaski Bridge we make our way through a small part of Queens with the crowd support still going pretty strong at this point. Onto the Queensboro Bridge we were touched again by the hand of God. The wind was just absolutely brutal whipping right up the East river. A steady climb along the lower level crossing Roosevelt Island, no crowd support just the wind and the other runners fighting it out, complaining about the wind. I felt defeated from battling the wind at this point as we descend into Manhattan. Coming off the Queensboro Bridge and onto 1st Ave was an experience in itself. At the Expo on Friday they had warned us this could be a place where our pace might get thrown off. The crowds were ENORMOUS along 1st Ave and at some points were fifty deep on each side. There were more bands, DJ’s, MC’s. People with signs cheering for friends and loved ones, children wanting to reach out and touch the runners as we passed, again we were all Rock Stars. I could feel my adrenaline kick in again as I ran towards the left side of the road, running up 1st Ave giving high five’s to everyone. People in the crowd were calling my name, yelling words of encouragement, again with the hugs and I have a smile from ear to ear. In the back of my mind I know that my wife and kids will be at mile 18 96th street waiting for me. I start to look at street numbers along 1st Ave because I’m worried I will get carried away in all the energy I’ve been surrounded with and run right by them. I look up and I’m at 94th Street, I’m getting excited just two more blocks to go. And there in the distance I see my son Michael holding in the air a pink foam pool noodle they brought so I would be able to pick them out of the crowd. However hey did not see me approaching as I ran up and grabbed them all with a HUGE hug and kiss. They were so excited to see me as I was to see them and it gave me a quick boost of energy that I needed. Taking off and shortly after crossing the Willis Ave Bridge from Manhattan into the Bronx. Mile 20, I hit the wall! The distance, the wind and the cold had finally begun to take its toll. I told myself “Joe six more miles” you’ve got this. There was no way I was going to let myself be defeated. Crowds had thinned quite a bit at this point, as I pressed on. Crossing the Madison Ave Bridge from the Bronx back into Manhattan was a steep incline, the wind again was taking its toll and I took a short walk break. I’m back running! Mile 21: I look over and see a guy stretching his calf on the side of the road. My left calf was burning a bit so I figured I’ll stop quickly and stretch. I look over at him and say “Hey we have five miles left, let’s finish this” Dave from Sweden looks at me and asks if I’d finish it with him he was hurting. I responded, ABSOLUTELY! Mile 22: Dave is in real pain with severe side stitches and pushes me to carry on without him. I said no way we finish together, Dave insisted so I started to pull away. Both my glutes and my quads are on fire at this point. I’m dehydrated, exhausted and I take another short walk break. Mile 23: On 5th Ave along Central Park and the crowds are nuts! I go through the water stop, grab a cup, I chug it, grab another take a few sips and toss it. I start to run, one hundred feet south of the water stop is a woman holding a box of grapes. She looks at me and says “Joe, grab a handful of energy and go finish this”. I reached in grabbed that handful and took off. Mile 24: We are in Central Park and the crowd is going strong, I’m still moving. Mile 25: Starting out of Central Park and onto Central Park South, I’m looking for Julie and the boys in the crowd. Crowd is overwhelming at this point. I cannot see them. Suddenly I hear “GERONIMO” I turn to my left and there they are waving and cheering. I make the right on CPS and I know this spot well. In 2011 we watched the Macy’s Thanksgiving Day Parade right here. I’m in the home stretch! Mile 26: Columbus Circle, making the right back into Central Park and I can see the finish line. I’ve got this! Mile 26.2: My feet cross the finish line confirming that I’m officially a marathoner. I’m cold, tired, sore and disoriented. A volunteer puts my finisher medal around my neck and congratulates me, I begin to tear up. Another volunteer wraps me in a plastic New York City Marathon throw to keep me warm and congratulates me, I mumble a thank you. Waddling my way through Central Park towards the exit at 72nd street, I chug a bottle of Gatorade even though Gatorade and I don’t get along. I eat an apple and even try one of those extremely gross power bars things. Yeah I was that hungry! After a few bites of the bar I chucked it into the garbage. 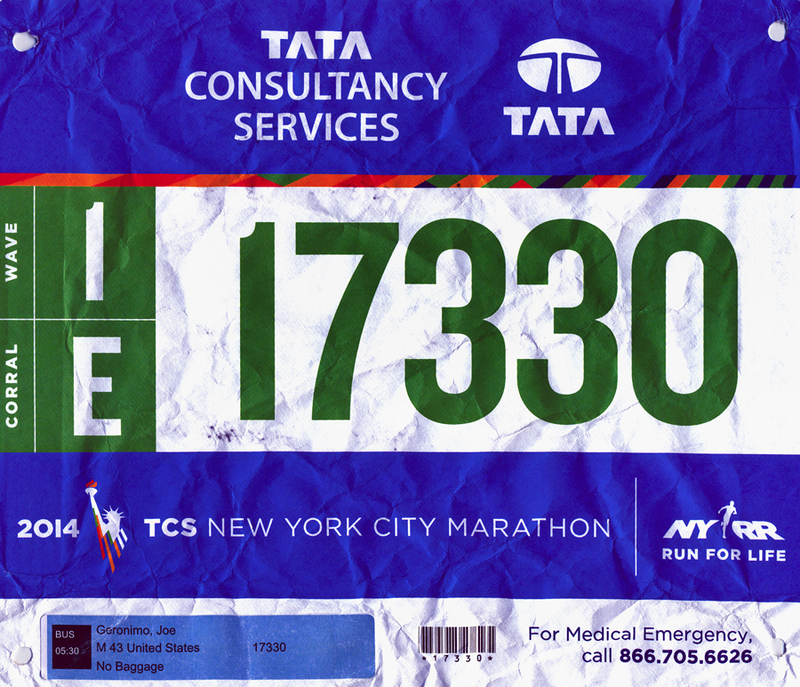 Craving a ham and cheese sandwich I made my way onto Central Park West where another volunteer wrapped my in a beautiful 2014 TCS New York City Marathon fleece lined poncho. She secured it for me, congratulated me and I stumbled my way towards 62nd street to the family reunification. There is where I met up with Julie and the boys. There they hugged me and congratulated me and told me how proud they were. Still craving my ham and cheese sandwich we made our way into the subway at Columbus Circle. The stairs were very difficult! Shortly after we arrived at Penn Station and the Long Island Railroad. With about 5 minutes to catch our train I was denied my sandwich. The train ride to my parents was 90 minutes, but it was quiet and relaxing. Checking my phone my email inbox was inundated with messages of congratulations, good luck and so forth. Put it in perspective I had over 600 emails. After being picked up at the station by my dad all I wanted was a hot shower and food! Waiting for us were my brother and his wife, My sister with her family, my uncle and mom. Finally my hot shower, and then a huge spaghetti and meatball dinner followed by some awesome desserts. Julie Geronimo, I love you and thank you for all of your sacrifice and support over these last few years. I could have never done this without you. Diana Bean, where do I begin? This is all your fault, you pushed me to run my first ever race back in 2012. I will ever be grateful, Thank you! To all of you who have done nothing but support me and cheer me on you all are AWESOME & AMAZING!!!! I’m so fortunate to have you all in my corner. Thank you! I loved it! The New York City Marathon was amazing, the people of New York are truly awesome and that’s what makes it the best city in the world. One journey for me has now come to the end. To be honest I don’t know what is next. All I can tell you is I love to run, I love the running community and I look forward to what is in store for my future. What a great commentary on your experience in running your first NYC Marathon. Dad and I are so very proud of all that you have accomplished in participating in this grueling trek through the five boroughs. You did an amazing job fighting the wind, pain and competition. CONGRATS!!!! You are awesome!!!!!!!!!! Grueling yes, fun “Hell Yeah” Rock Star for the day!!!! Thank you for your love and support mother… See you soon! Ditto what your Mom said! 🙂 I teared up as I read it – the little Joe I remember from across the street has come a long way! Congratulations on such a huge accomplishment.